Rivaroxaban is a direct oral anticoagulant (DOAC) indicated to reduce risk of stroke and systemic embolism in patients with non-valvular atrial fibrillation (AF). A discrepancy exists between the recommended dosage and real-world use of DOACs, especially rivaroxaban, thus putting patients at risk of thromboembolic events. Methods: This retrospective study assessed real-world prescribing and patient adherence to dietary requirements during use of rivaroxaban in 116 patients with AF. Associations between prescriber specialty and the correct dosing and administration were assessed using the Chi-Square test. Results: Most rivaroxaban prescriptions were ordered by cardiologists (50.9%). Sixty-nine patients (59.5%) were taking the right dose at the correct time with an adequate meal. Of the 47 (40.5%) taking rivaroxaban incorrectly, 39 (33.6%) had not been administered an adequate meal and eight (6.9%) were not prescribed the correct dose. Compared with other prescribers, patients were most likely to be taking the correct dose and administration when prescribed by cardiologists (72.9% versus 45.6%; p=0.003). Patients were least likely to be taking the correct dose and administration when prescribed by primary care providers (44.4% versus 69.0%; p=0.009). This difference was driven by patients who did not take the treatment with an adequate meal. Conclusion: Inappropriate prescribing, administration and non-adherence to DOACs can have devastating consequences. This highlights the importance of formal systematic education of patients prescribed DOACs across the whole health system. Future studies are warranted to explore the impact of non-adherence to rivaroxaban dietary requirements on clinical outcomes. Steven K Krueger is on the Speaker’s Bureau for Amgen, Boehringer Ingelheim, Novartis, Regeneron Pharmaceuticals, Sanofi, Orexigen Therapeutics, Janssen, Kowa Pharmaceuticals, Pfizer, Bristol Myers Squibb and Amarin. Madeline R Leiter, Kathleen A Packard and Yongyue Qi have no conflicts of interest to declare. Compliance with Ethics : All procedures were followed in accordance with the responsible committee on human experimentation and with the Helsinki Declaration of 1975 and subsequent revisions. This retrospective study documents provider prescribing and real-world patient adherence to dietary requirements during self-administration of rivaroxaban for AF. This retrospective study was conducted at Bryan Health Medical Center in Lincoln, Nebraska between January 2014 and January 2017 in 116 consecutive, unique individuals. The protocol was reviewed and deemed exempt by the Creighton University Institutional Review Board. Patients were included if they were seen in cardiology consultation for AF and were already taking rivaroxaban prior to evaluation. Data collected from each patient included prescribed dose, renal function (current and at the time of rivaroxaban initiation), prescriber specialty and patient adherence. Prescriber specialty was the specialty of the provider that initiated the prescription prior to the cardiology consult. Renal function was calculated using the Cockcroft-Gault equation using actual body weight. If the patient’s actual body weight was greater than 20% of ideal, then adjusted body weight was used. A patient was considered dosed inappropriately using their renal function at the time of prescribing. Patients were considered non-adherent if they reported missing any doses, if they were administering during a fasting state or administering only with a small meal or snack. All patient adherence data was self-reported. The same investigator, a cardiologist, assessed whether or not the patient was taking with an adequate meal by asking the patient if they were taking with a meal, which meal and what the meal consisted of. Categorical variables are presented as frequency and percent. Associations between professional specialty and the correct dosing and administration were assessed using the Chi-Square test. All statistical analysis was performed in IBM SPSS Statistics for Windows, Version 24.0 (Armonk, NY: IBM Corp.). 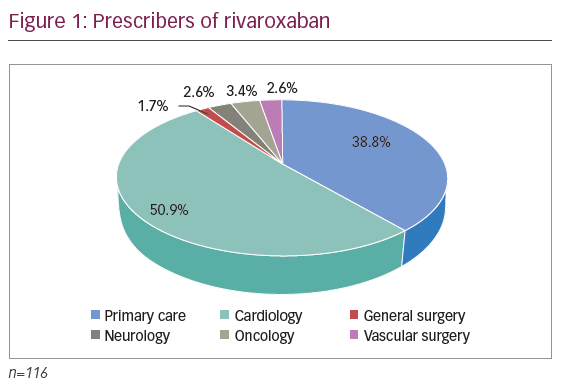 Figure 1 indicates that the majority of prescriptions for rivaroxaban in this sample were ordered by cardiologists (59, 50.9%), followed by primary care physicians ([PCP] 45, 38.8%), oncologists (4, 3.4%), neurologists (3, 2.6%), vascular surgeons (3, 2.6%) and general surgeons (2, 1.7%). Of the 116 patients assessed, 69 (59.5%) were taking the correct dose based on indication and renal function and taking at the correct time with an adequate meal (see Table 1). Of the 47 (40.5%) taking rivaroxaban incorrectly, 39 (33.6%) were not administered with an adequate meal and 8 (6.9%) were not prescribed the correct dose. Of the incorrectly dosed patients, 2 (1.7%) were too high and 6 (5.2%) were too low. All patients reported that they had not missed any doses. Table 2 compares the prescribing pattern of rivaroxaban by professional specialty. 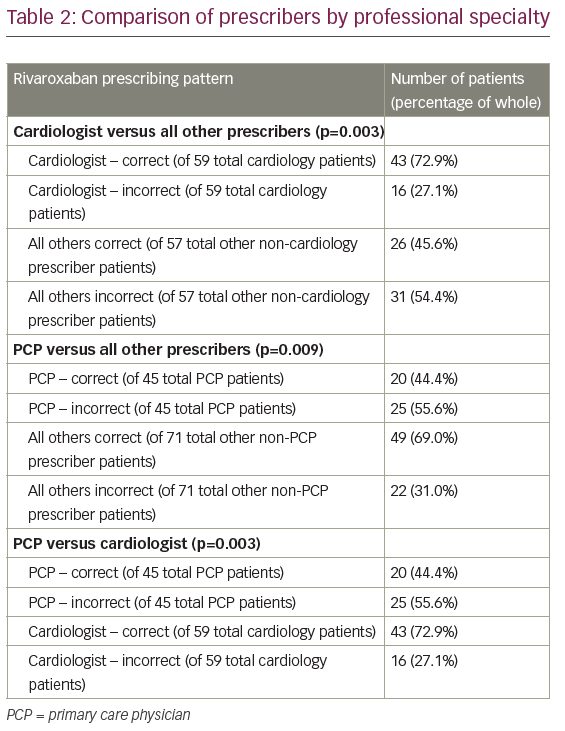 Compared with all other prescribers, patients were most likely to be taking the correct dose with correct administration when prescribed by cardiologists (72.9% correct versus 45.6% correct, respectively; p=0.003). Patients were least likely to be taking the correct dose with correct administration when prescribed by PCP (44.4% correct versus 69.0% correct, respectively; p=0.009). 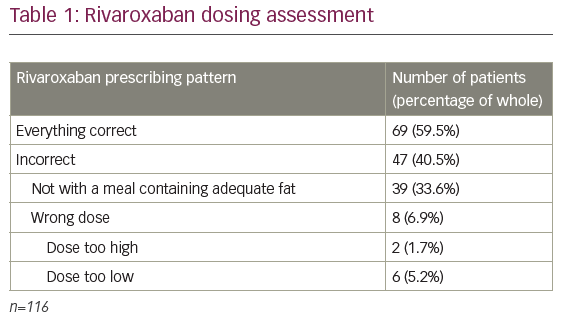 It should be noted that of the 25 patients that were prescribed rivaroxaban by a PCP and taking it incorrectly, only 4 (8.9%) were dosed incorrectly by the prescriber (see Table 3). However, 21 (46.7%) of patients taking rivaroxaban prescribed by a PCP were not administered with an adequate meal. Inappropriate prescribing, non-adherence and inappropriateadministration of anticoagulation can have devastating consequences. This study demonstrated a gap in patient awareness of proper administration of rivaroxaban with an adequate meal in that 33.6% of patients were not taking with a meal. This is similar to the 32.3% recently reported by Tellor et al.9 During this process, many patients anecdotally reported no knowledge of the requirement to take with an adequate meal. Patients under a cardiologist’s care were most likely to be taking rivaroxaban correctly and this may be due to increased exposure of this specialty to continuing education regarding prescribing of DOACs. Alternatively, the advantage may be due to a team-based approach to care often utilised in cardiology practice groups. Both inpatient and outpatient care of AF patients is often multidisciplinary, allowing for collaborative and shared responsibility for patient education amongst cardiologists, mid-level providers, nurses and pharmacists. Conversely, of the 45 patients prescribed rivaroxaban by a PCP, 21 (46.7%) were not administered with an adequate meal. These results highlight the opportunity for community pharmacists to play a role in closing the gap in patient education as it relates to the dosing and administration of rivaroxaban. Community pharmacists are often the last healthcare providers in contact with the patient before outpatient medication administration. Survey data to assess the rivaroxaban patient education practices from various providers and also community pharmacists are warranted to better explain these findings. One limitation of this study is the fact that it is small, conducted at a single institution, and only assessed one indication (AF) for rivaroxaban. Thus, caution should be utilised when extrapolating these results to the general population or for other DOACs or indications. The retrospective nature of this study also forced investigators to rely on prescriber documentation thus leaving room for bias. As previously mentioned, the number of prescribers for certain disciplines was small and therefore there was no meaningful way to compare their prescribing habits independently. The investigators also relied on patient reporting for adherence and meals. For simplicity, it was only recorded if the patient took the medication with a meal or no meal/snack. Macronutrient content was not assessed. Whether or not the patients received education was also not captured; therefore, conclusions based on counselling practices need to be confirmed with further research. Finally, because rivaroxaban is a once-daily DOAC for AF, which does not require monitoring like vitamin K antagonist and is generally well tolerated, it has been associated with greater adherence and persistence compared with other anticoagulants.10,11 Consequently, prescribers may be more likely to prescribe rivaroxaban patients with documented historical non-adherence. Therefore, non-adherence to the dietary requirements observed in this study may be more attributable to patient characteristics as opposed to lack of patient education by the healthcare providers. Though patients prescribed rivaroxaban by a cardiologist in this study were more likely to have received education regarding correct administration of rivaroxaban, there is clearly an education gap that has been supported by other studies.9 This highlights the importance of formal systematic education for all patients prescribed rivaroxaban and other DOACs, in the hospital, office and community settings, including information regarding co-administration with a meal. Future studies are also warranted to explore the impact of non-adherence to rivaroxaban dietary requirements on clinical outcomes. Janssen & Bayer. Rivaroxaban (Xarelto) package insert. Titusville, NJ; 2011. Alamneh EA, Chalmers L, Bereznicki LR. Suboptimal use of oral anticoagulants in atrial fibrillation: has the introduction of direct oral anticoagulants improved prescribing practices? Am J Cardiovasc Drugs. 2016;16:183–200. Yao X, Shah ND, Sangaralingham LR, et al. Non-vitamin K antagonist oral anticoagulant dosing in patients with atrial fibrillation and renal dysfunction. J Am Coll Cardiol. 2017;69:2779–90. Jackevicius CA, Tsadok MA, Essebag V, et al. Early non-persistence with dabigatran and rivaroxaban in patients with atrial fibrillation. Heart. 2017;1:1–18. Stampfuss J, Kubitza D, Becka M, Mueck W. The effect of food on the absorption and pharmacokinetics of rivaroxaban. Int J Clin Pharmacol Ther. 2013;51:549–61. Kubitza D, Becka M, Zuehldorf M, Mueck W. Effect of food, an antacid, and the H2 antagonist ranitidine on the absorption of BAY 59-7939 (rivaroxaban), an oral, direct factor Xa inhibitor, in healthy subjects. J Clin Pharmacol. 2006;46:549–58. Beyer-Westendorf J, Siegert G. Of men and meals. J Thromb Haemost. 2015:13:943–45. Patel MR, Mahaffey KW, Garg J, et al. Rivaroxaban versus warfarin in nonvalvular atrial fibrillation. N Engl J Med. 2011;365:883–91. Tellor KB, Patel S, Armbruster AL, Daly MW. Evaluation of the appropriateness of dosing. Indication and safety of rivaroxaban in a community hospital. J Clin Pharm Ther. 2015;40:447–51. McHorny CA, Peterson ED, Laliberte F, et al. Comparison of adherence to rivaroxaban versus apixaban among patients with atrial fibrillation. Clin Ther. 2016;38:2477–88. 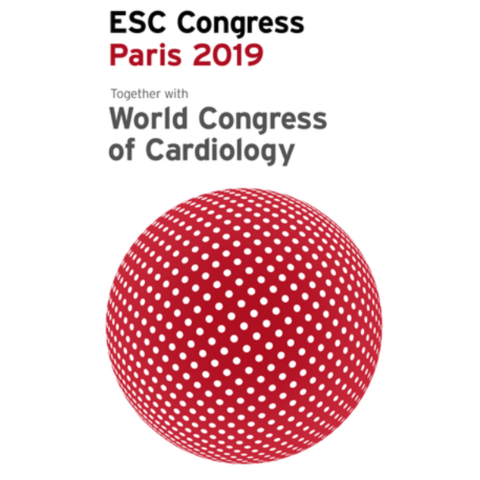 Beyer-Westendorf J, Ehlken B, Evers T. Real-world persistence and adherence to oral anticoagulation for stroke risk reduction in patients with atrial fibrillation. Europace. 2016;18:1150–7.